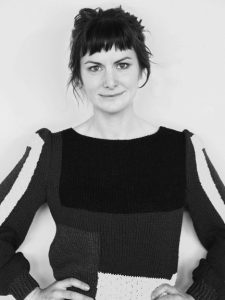 Julia May Jonas is the founder and Artistic Director of experimental theater troupe Nellie Tinder. Recent plays include EMILY CLIMBS (Machine Méchant) (TONY Critic’s Pick), Evelyn (TONY Critic’s Pick), For Artists Only (Backstage Critic’s Pick), BG1987RECEP, Lake Coordination (Finalist: Clubbed Thumb Biennial Competition) and the in-process All Long True American Stories (a play cycle). Her work has been presented/developed at venues including The Bushwick Starr, Incubator Arts Center, The International Revolutions Festival in New Mexico, The Brick, Dixon Place, HERE Arts Center, PS122 (with TerraNova) and the International Theater Society of Vietnam. She frequently shows work with Little Theater at Dixon Place and the CATCH! Performance series. She has held residencies with The Bushwick Starr, The Invisible Dog, BAX, Incubator Arts Center, Chashama, et al. Nellie Tinder has been granted continued support by The Mental Insight Foundation and The Rockefeller Foundation. MICHIGAN MURDERS, a project in collaboration with Meghan Finn and composer Brian Cavanagh-Strong has been awarded a NYSCA Independent Artist Commission for 2017 and is being developed with the New Works Initiative at Montclair State University for a University Premiere in Spring of 2017. Jonas is an affiliated artist with New Georges, a 2016 NG Audrey Resident, and a 2016/17 member of The Jam. She holds a MFA in Playwriting from Columbia University under the tutelage of Chuck Mee and Kelly Stuart.